Farnborough, UK/Harbin, China – July 18, 2018 - Euramec, the European flight simulation manufacturer, unveiled the world’s first flight simulation combi solution of a Diamond DA-40 and DA-42 series at the Farnborough International Airshow here. The unique DA-40/DA-42 solution now offers flight training schools a 2-for-1 package that underlines the mission of Euramec to offer the most cost-effective flight training devices for the market. In less than 30 minutes, the flight simulator can be reconfigured for either of the Diamond Series aircraft. The consoles that are being swapped to prepare the flight simulation for either a DA-40 or a DA-42 set up, are in turn ready-made to allow students for desktop training by other students. “Our solution is a world first and perfectly meets the demand of flight training organisations to maximize their return on investment,” Bert Buyle said. Montréal, July 18, 2018 – Bombardier Commercial Aircraft announced today that it has signed a firm order for four new CRJ900 regional jets with Uganda National Airlines Company. Boeing has awarded Saft a contract to fit all its new 777 and 777X airliners with onboard rechargeable nickel-cadmium battery systems comprising ULM ultra-low maintenance Eversky TM batteries combined with a dedicated charger. The new Saft battery system is designed to offer Boeing 777 operators superior performance and a lower total cost of ownership (TCO) due to extended maintenance intervals. Customers can retrofit existing 777 airplanes with these new systems distributed by Boeing Global Services subsidiary Aviall. The Boeing 777 battery system provides onboard power for APU (auxiliary power unit) starting and backup for critical systems. It comprises a 60 Ah, 24 V ULM battery together with a charger. Two battery systems are fitted to each airplane. 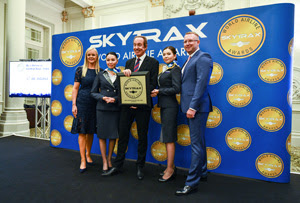 London, UK - Air Astana, the flag carrier of Kazakhstan, has been recognised for 4 Star service excellence, retaining the accolade of ‘Best Airline in Central Asia and India’ in the Skytrax World Airline Awards for the seventh consecutive year. The prestigious awards ceremony took place at the Langham Hotel in Central London yesterday.